MANILA, Philippines – High school standout Will Gozum is coming home to University of the Philippines (UP), a few years after first making a name for himself with the Junior Maroons. Gozum initially teamed up with the Gomez de Liaño brothers for the UPIS Junior Maroons, before making his way to Mapua High School. There, he won NCAA juniors MVP honors, won a title, and developed into one of the most sought-after recruits in his class. Several teams went after the 6-foot-6 Gozum. 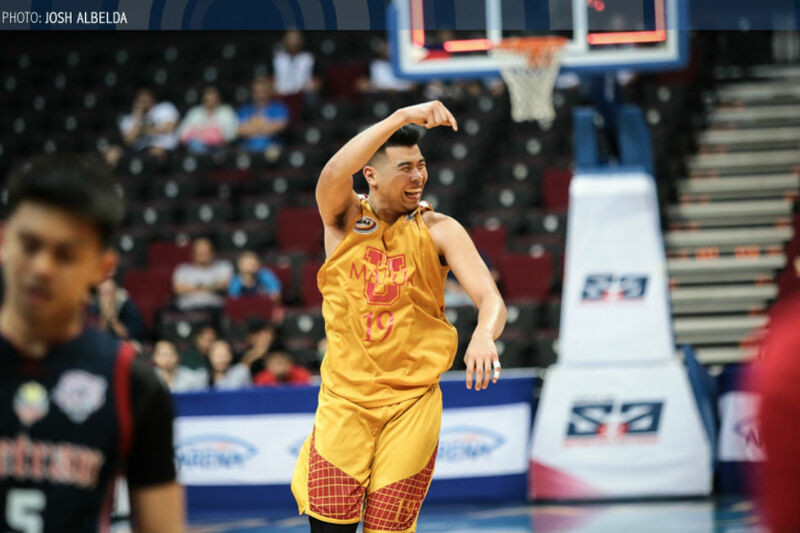 According to sources, National University and University of Santo Tomas were among the teams that recruited him heavily, but Gozum rebuffed other offers to come home to UP. "Nakaka-lambot ng puso," Gozum told reporters on Monday after participating in Gilas Pilipinas practice at the Meralco Gym. "Tinanggap pa rin nila ako." Asked why he eventually wound up choosing to go to UP, Gozum had a simple answer. "Kasi… UP kasi eh. UP," he said. Indeed, the school remained very close to his heart. It helped very much that the Gomez de Liaño brothers, who remained his good friends even when he left for Mapua, were constantly encouraging him to return to UP. Gozum revealed that even as high school players, they have always dreamed of playing together and winning a championship in college. "Magkakasama ulit kami," he said. "Kaya ayun talaga – babalik at babalik talaga." He spoke highly of Javi and Juan Gomez de Liaño, who are often touted as the future of the UP men's basketball team. The two provided the final push for Gozum to return to UP. "Sobrang bait ng dalawang 'yan," Gozum said. "Kahit na nasa (NCAA ako), sinusubaybayan nila ako. 'Yung game ko, kung pangit, pinababawi nila ako. Kahit down ako, ina-ano pa rin nila ako." "Sila rin 'yung dahilan kung bakit talaga ako babalik sa UP," he added. "(Si Juan) lagi nagsasabi, 'Will, UP.' Tapos champion daw next (season). Malakas daw." Juan Gomez de Liaño, the reigning UAAP Rookie of the Year, downplayed his role in Gozum's recruitment, but could not hide his delight at reuniting with his old friend and teammate. "'Yun talaga ang dream namin, to play together sa college," said Juan, who like Gozum is a member of the "23 for 23" Gilas cadet pool. "Will came in UPIS, third year high school. We've been talking na, let's try to play rin sa college, let's try to give them a championship." Gozum is not the only high-profile player to join UP in Season 81. Bright Akhuetie is also set to make his debut after completing his residency requirements. With the Gomez de Liaño brothers and star guard Paul Desiderio still in the fold, the Fighting Maroons should finally take the next step towards being a true contender next season. The pressure is there for Gozum, but he refuses to be swept up in it. "Trabaho lang talaga kami," said Gozum. "'Yun lang ang gagawin namin. Trabaho lang. Ang balak talaga namin is Final 4 muna, tapos championship talaga."